Horseshoe Bay Wilderness Area is located a few miles north of Mackinac Bridge and the tourist town of Street Ignace. 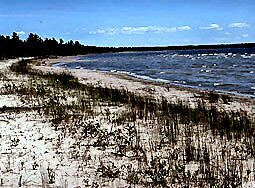 The area contains seven miles of Great Lakes frontage on Horseshoe and Street Martins Bays, in northern Lake Huron. A sandy beach is found along the southern third of the area. The northern two-thirds vary from marshy to rocky, depending on the character of the adjacent land. It is a perfect place to explore by kayak. This area was once prime fishing and hunting grounds for Native Americans. It is home to a large variety of wildlife, including beaver, black bear, coyote, deer, eagles, osprey, otter and mink. Horseshoe Bay itself is a beautiful beach, where the sand is smooth and the water is a tropical turquoise in color. Sorry, we have no listings for this bay at this time.